The demands of parenting are endless. Ensuring that a child (or two or three or four) has what he or she needs to grow and thrive can be as thrilling as it is demanding. We want to give our children all the things we didn’t have, to guarantee experiences to shape them into humans that can take on the challenges of the real world. But the truth is, sometimes we overdo it. Sometimes, instead of adding another toy to the toy box or downloading another educational app on the iPad, all we really need to do is let our children reach for the play thing that doesn’t cost a dime and ensures a lifetime of excellent entertainment: their imagination. There are days when it feels like growing up in the late 20th century makes me a dinosaur, especially in the eyes of my students. For them, life without instant communication, a phone in their backpack at all times, and endless access to the internet seems like life in the stone ages. Even in an age when our children have constant, instant entertainment at their fingertips, it is more important than ever to ensure they are receiving an appropriate amount of play time using nothing but their own minds. 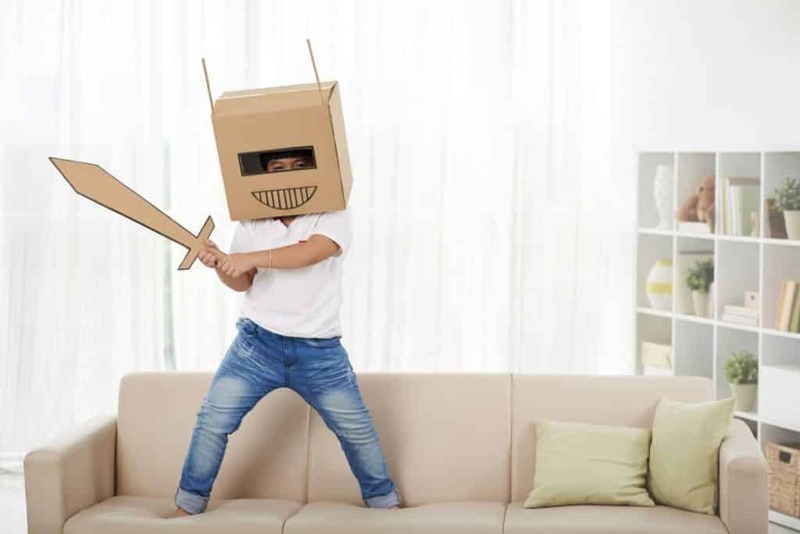 Playing pretend gives children the ability to develop crucial skills that they may not build as easily with technology alone. Now, in no way am I casting judgement on giving yourself a little downtime after a long day of work by putting an iPad in those little hands; there are many, many benefits to technology and our world wouldn’t be thriving without it. Plus, I’ll be the first to admit that sometimes that ten minutes of silence is worth it at the end of a long day! I am, however, advocating that we balance the tech time with enough creative, imaginary playtime to let our children develop the skills they need to thrive in society. Imaginary play gives children the chance to role play and engage in the social and emotional roles of everyday life. Whether they are pretending to be a firefighter, a superhero, or a princess, they are having experiences that allow them to view life from someone else’s perspective, creating empathy that will better equip them for social situations. When they are encouraged to play pretend with friends, siblings, or parents, they are even more likely to develop the social and cooperative skills that will help them as they grow and mature. Imaginary play is also critical to the development of a child’s language and thinking skills. By mimicking conversations they hear while observing everyday life (that would be you, Mom and Dad! ), children will develop their own conversational skills and make connections between their own enchanted world and real life. This connection is crucial to engaging a child’s critical thinking skills and taking them into higher level thinking. If a child and his playmate both want to play a certain role, they will be faced with the opportunity to problem solve and create a role that allows both to enjoy playtime. This kind of problem solving is the first step in a skill that children must possess to be successful not only in school, but also in adulthood. Additionally, there is research showing that imaginary play can benefit the development of the frontal lobe, thus decreasing the need to rough house or act out. For an overly energetic child, or one who is “all boy” (like my own), this is a huge benefit! While it is important to keep up with today’s technological advances, sometimes the old saying “keep it simple” wins. That’s the point of pretend play—simplicity, at least on the surface. Who knows what kind of depths your child’s mind is reaching! Brittany is a wife, mommy to her son, and 7th grade educator with a passion for reading and writing.